Playing with patterns or sequences, kids can speak lots of Spanish. I like pattern activities because you can associate vocabulary with a picture, an object or an action. In Spanish, patterns are called secuencias or patrones. This is a simple printable activity to use with beginning Spanish learners. I included the words for the vocabulary because I’ll be using it with emerging readers. These activities also work well with only pictures. You can also add context to pattern activities by asking a question about what is missing from a sequence. Read more about adding context to pattern games. In addition to the words for the objects in a sequence, children learn other language. They can practice common verbs like seguir (to come next or to follow) and hay (there is). They also use adverbs like primero (first), entonces (then), and después (then) as they talk about patterns. Primero hay un perro. / First, there’s a dog. Después, hay un gato. / Then, there is a cat. Sigue otro gato. / Another cat comes next. ¿Qué sigue? ¿Un perro o un gato? / What is next? A dog or a cat? ¿Cuál es la siguiente figura? / What is the next figure? There are lots of ways to make patterns with kids. 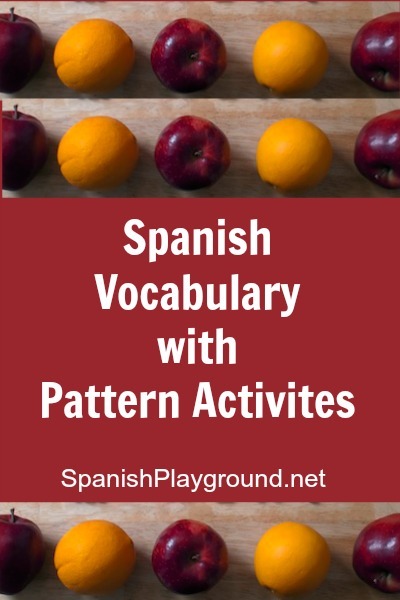 – Use household objects (plato, tenedor, cuchillo, vaso) to make patterns. – Use fruit to make patterns. – Make patterns of colors and sizes with blocks or Legos. – Use stickers or rubber stamps to make patterns. – Use small crackers of different colors or colored cereal to make patterns. – Make patterns using vocabulary cards or playing cards. – In class, we thread beads of different colors. The kids take turns making a pattern everyone can see using paper shapes. Everyone strings beads in that pattern and says the colors as they put them on. Then the next child makes a pattern. – We also make patterns with movements like salto, salto, aplauso, salto, salto, aplauso (jump, jump, clap, jump, jump, clap). – We do patterns with body parts touching them as we say each one: Cabeza, cabeza, brazo, pie. Cabeza, cabeza, brazo, pie. There are lots of printable pattern activities online. For example, Matemáticas Ejercicios Resueltos has PDFs of patterns with shapes and colors. This is a really great way to link language learning to other curriculum areas.